By now, we all know we’re enduring the driest winter in 500 years. It is not clear how long this drought will last, or how it will ultimately affect Santa Barbara County economically and socially. We do know we’re going to have to pursue some emergency measures, including bringing Santa Barbara’s currently mothballed desalinization plant online. One reactivated desal plant, of course, is insufficient to take us through any long-term drought. Santa Barbara’s water emergency reflects a larger crisis affecting the state. Ultimately, our problem is one of policy. To assure a secure water future, we must change the way water is distributed, and that means we must change the way the State Water Project and the federal Central Valley Project operate. Our water is limited even in the wettest years, and much of it is used in a prodigally wasteful fashion to irrigate subsidized crops in the corporate farmlands of the western San Joaquin Valley. • Reinstate the “urban preference” that was nullified by the Monterey Plus Amendments, the 1997 sub rosa deal between large water contractors and the state Department of Water Resources. This agreement stripped the long-standing priority of urban areas over agriculture during water shortages. As a result, cities are at great risk of running out of water during droughts. • Return the Kern Water Bank to public ownership. This vast aquifer west of Bakersfield can be recharged with up to one million acre-feet of water and was intended as drought insurance for South State cities. The Monterey Plus Amendments allowed the intrusion of private interests into this formerly public resource, with the result that it is now controlled by Paramount Farms, a Roll Corporation subsidiary owned by influential Democratic Party contributors Stewart and Lynda Resnick. A recent court ruling determined that state officials did not adequately consider the environmental impacts of privatizing the bank. While this is a positive development, we must do everything possible to return the Kern Water Bank back to public hands. • Balance water rights permits with the amount of water that is actually available. Currently, water rights permits exceed the amount of water that exists by a factor of five. Water that is claimed above existing supplies is known as “paper water,” and it is used by agribusiness and water speculators to drive unsustainable crop expansion and urban sprawl. • Implement aggressive programs for water conservation, recycling, storm-water capture, aquifer recharge, and groundwater and marine desalinization. These measures alone can yield up to five million acre-feet of additional water for California: enough to satisfy the needs of 15 million to 20 million people. • Agriculture uses 80 percent of the water in California, and much of it is applied wastefully. Hundreds of thousands of acres of drainage-impaired lands in the western San Joaquin Valley are irrigated heavily, flooding the San Joaquin River and the Sacramento-San Joaquin Delta/San Francisco Bay estuary with toxic levels of selenium. We can and must require corporate agriculture to reduce water consumption by at least 30 percent. This will require land retirement in the western San Joaquin and, in areas where water supplies can’t be sustained, a reduction of water-intensive crops such as pistachios, pomegranates, almonds, and walnuts. 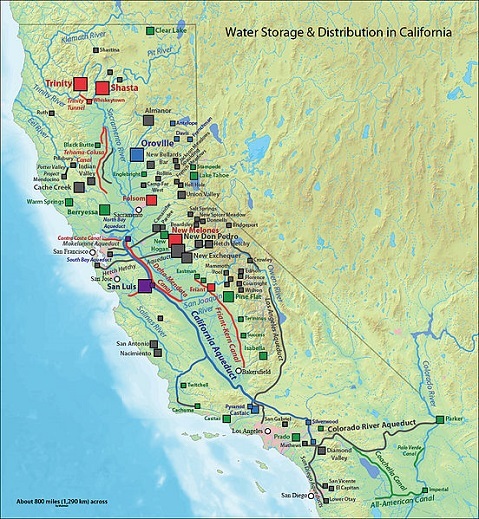 • Restrict all Delta diversions — including State Water Project and Central Valley Project exports — to three million acre-feet a year. Peer-reviewed research confirms any pumping beyond this figure degrades, and will ultimately destroy, the richest estuary on the West Coast of the continental United States. We don’t have to wipe out our fisheries and wildlife to assure adequate water for all. Crises bring out both the worst and best in people. Make no mistake, California is now in a crisis of unprecedented scope. Both our children and history will judge us on our response. Carolee Krieger is president and executive director of the California Water Impact Network (C-WIN) located in Santa Barbara.